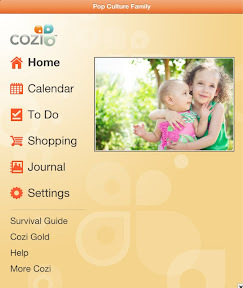 Cozi is a very simple digital solution to a common household problem: every member of the family has different appointments and obligations, you need groceries, there is a big list of punch items to be done, meals need to be planned, some new recipes would be nice, and oh yeah, you're tired of sending Outlook reminders to everyone. Enter Cozi. Cozi is a one-stop shop for all of these items. The family gets one login name and one password [take note of this, as Pop Culture Dad forgot this fact when he changed the family password last week. Fortunately, Cozi sends an email to all family members when this happens]. 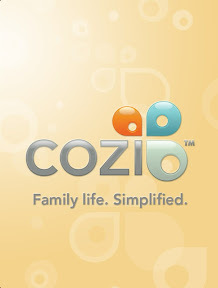 You can access Cozi online at Cozi.com or you can download the app (for iPhone/iPad and Android). 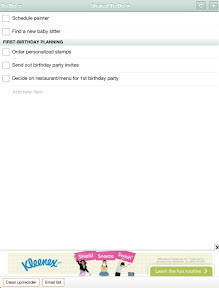 The calendar allows you to select which family member(s) are attending which appointments. 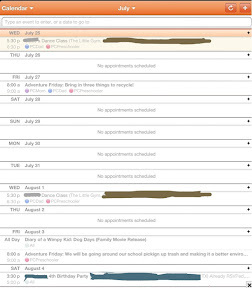 Additionally, each family member is assigned a color (which you can change), which makes it easy to tell which appointments are whose at a glance. Every family member who logs in will see all appointments, but reminders are only sent to those attending. Every registered family member receives a weekly summary of the appointments once a week. One added perk is that you can download an app for Microsoft Outlook that allows Cozi to sync with Outlook either manually or on a schedule. I have this on Outlook at work, so that I don't have to worry about copy/pasting my work events into Cozi. Less work, ya know? The to-do list is pretty easy to master. It is easily edited and even allows you to make header categories for different groups of tasks. The grocery list allows any family member to add and check off items needed and no longer needed. BONUS: Recipes. 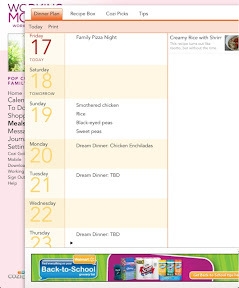 Cozi not only contains a section to list your meal plan for the weeks ahead, but also provides recipes. 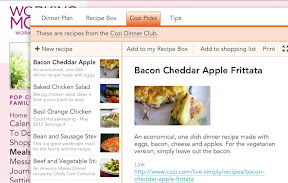 If the Cozi recipes don't tickle your fancy, you can add your own recipes manually or even upload them from the internet. This may be a good way to try out all of those recipes you keep pinning on Pinterest. Oh yeah, Cozi also lets you add the ingredients from the recipe to the grocery list. All of this comes in the basic version, which is free. You just have to put up with ads and deal with having only one alarm on your reminders. For an ad-free experience with three alarms (plus a few other features), you will need to upgrade to Cozi Gold. Cozi Gold is $4.99 a month or $49.99 for a year. I've been using the Basic subscription for a couple of months now, and it is just fine for our purposes. Before Cozi, Pop Culture Dad and I had been sending each other Outlook reminders (sometimes we still do) and texting each other at the grocery store. This is a more interactive way of doing things. It also makes it more clear when I'm making appointments that were previously just for FYI, that I really don't expect anyone else to attend. Hi This is Carol from Cozi. Just wanted to pop by and say thanks so much for giving your readers such a detailed description of how Cozi works. We really appreciate it!